With winter well underway in Glastonbury, we know this is the time of year we need to protect our kids more than ever, since this is when our children are susceptible to illnesses. At Foundations for Learning, we want to make sure your kids are protected from all the illnesses that roam around and run rampant during the winter time, especially the flu. That is why we require all our kids get the flu shot. This helps protect your child as well as the rest of the school. When kids get the flu, is it more dangerous and we don’t want anything bad to happen to your child. At our child care center, we want to ensure that your kids are safe and healthy under our care. In this post, we are going to go over some ways to protect your children from illnesses in cold season. Washing hands is so important inside and outside our child care. Germs can stay on hands for long periods of time and then get transferred into your child’s system. Washing their hands before meals, after play time, after bathroom use, and following use of tissues will help keep all our kids healthy. The rule of thumb is to wash your child’s hands for at least 20 seconds. Make it a fun game by signing one of their favorite songs together to make it seem like no time at all! In a previous blog, we went over all the benefits of the flu vaccination. We are going to drill this point home. Getting the flu shot will help prevent many strains of influenza for your child. Furthermore, if your child were to get a strain of the flu, their symptoms should not last as long and not be as severe. While we promote sharing at our child care center with toys and games, we do not think it’s a good idea for eating and drinking utensils; this is how colds and other illnesses spread so quickly. You should take this practice home as well. If you have multiple children, it is important not to let them share drinks. Another idea when you have snack time, don’t use a community area. Create individual snack packs for each of your children and this will help avoid sickness. If your child does happen to get sick this winter, teach them proper cough etiquette. If your children know to cough into their sleeve instead of their hands or worse, with their mouth open, this will hinder the spread of germs. If they are to miss a step and cough into their hands, have them wash their hands right away! While it is tons of fun for your child to go to bounce houses, trampoline parks, and ball pits, these are the breeding Mecca for germs. 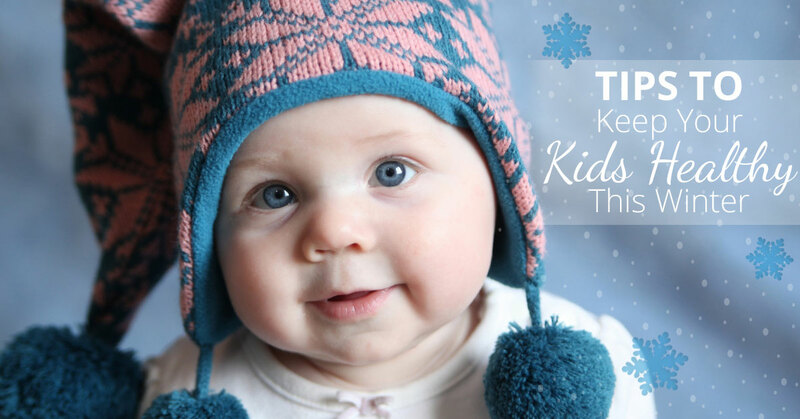 During the winter time, and cold season, it is best to avoid these areas as this brings a great opportunity for your child to get an illness. If you decide to go to these environments, make sure you wash your child’s hands frequently and before you leave the premises. Kids need a balanced and healthy diet as much as adults do. Make sure your children are always getting the important nutrients they need. At our child care center, we make sure your children are always getting nutritious, yet delicious, snacks and meals. Having a great diet, both at home and our child care center, can help keep your child happy and healthy. Not only is a great diet important, but also is a great sleep schedule. Most children need at least 10 hours of sleep until about age six. Make sure your children are going to bed at a reasonable hour and are getting an adequate amount of sleep. A healthy sleep pattern will keep their immune system fighting and protect them from colds and other illnesses in the winter months, as well as all year. At Foundations for Learning, your children are our number one priority. We want to ensure they stay healthy so they don’t have to miss class time with our amazing child care team and their friends and additional classmates in Glastonbury. Keep your kids wellness on track with these tips and a flu shot this season.